මේ සියලු ගැටලු නිරාකරණය කරන්න අපි අලුතින් හැදුව Speed Test ටුල් එකට පුලුවන්. අපි ස්පීඩ් එක පරික්ෂා කරද්දි යටින් ඩවුන්ලෝඩ් එකක් දැම්මට ඒක බලපෑමක් නෑ. මොකද අපි ඩොන්ගල් එකේ හාඩ්වයා ට්‍රාන්ස්ෆර් ස්පීඩ් එක තමා අරගන්නෙ. අනිත් එක තමා ටවර් එකේ ස්ථානයක් හුගක් නිරවද්‍යවය Google මගින් හොයාගන්නව. මේක තාම වැඩ කරන්නෙ වින්ඩෝස් එකක් විතරයි. 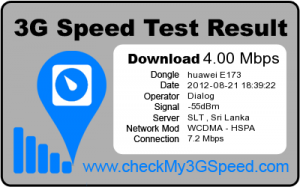 කරන්න තියෙන්න Checkmy3gspeed.com අඩවියට ගිහින් ටූල් එක ඩවුන්ලෝඩ් කරගෙන රන් කරන එක. ඒ කරද්දි කිසිම ස්ථාපනය කිරීමක් නෑ. ← Mr. Lalith Weeratunga, Secretary to the President of Sri Lanka, gives a lunch to a set of young bloggers and web professionals! Great tool. but it doesn’t detect my ZTE MF100 dongle even when I am connected to internet through the dongle. is this tool still supports huawei dongles? hodai obage wada mama nihathamaniwa agaya karanawa. mata mage Huawei E173 dongle aka unlock karana vidiha mail kannako.